With electric cars finally making it to the market -- at prices that are cost competitive with traditional gasoline-powered cars -- many of us are breathing a sigh of relief: There is a viable alternative that will allow us to keep driving. Fluctuating fuel prices and pollution are not the only costs associated with driving, however. Heavy reliance on automobiles wears down transit infrastructure and encourages sprawl development and other unhealthy practices. If people really wanted a greener world, we would drive less, not just make our driving greener. Since electric cars still need roads, the challenge of funding road maintenance and expansion remains. Upkeep costs used to be fully funded through the gas tax, however according to The Economist, this has not been the case since 2008. As a result, the federal government has to step in to cover the shortfalls at the state and local levels, resulting in the borrowing of $41 billion from the treasury to fund road maintenance. While roads have become more expensive, there appears to be minimal transition away from the lifestyle that already exists. There has been little headway in finding alternative forms of transportation that would divert people from driving. Several state governments, most notably Florida in 2011, have even killed plans to develop high-speed rail projects. The problem is exacerbated by the United States' relatively low population density. Geographically, the U.S. is the size of China, but it has only a fifth of the population. Outside its cities, the U.S. is particularly sparsely populated. This is an opportune environment for car travel. 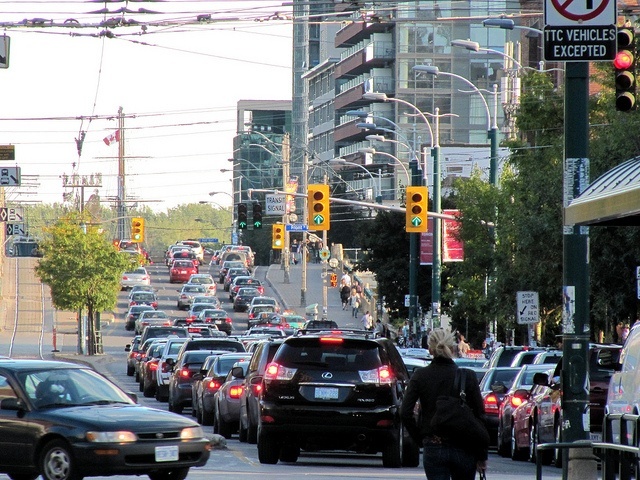 Cars encourage people to live wherever they want, which drives suburban sprawl. A famous map shows how much land would be required if the entire world lived like New Yorkers. All of humanity could live comfortably in an area the size of Texas. A new car requires 260 gallons of gasoline to produce, while weighing close to 3,000 pounds. For people who claim to be environmentalists, this is the opposite of living small. Due to their size, the mindset in the United States says that roads are for cars, and cars cannot share. Cars compete for road space with bikes. (The picture below shows the amount of space necessary for the same number of people to drive compared to bike.) The two cultures do not get along well. The relationship is so poor that it inspired the article, “Is it O.K. to kill cyclists” in the New York Times on Sept. 9, 2013, illustrating that bikers are treated as second-class citizens. Americans view the right to have cars on the road the same way we treat gun ownership. When New York City rolled out the Citi bike share program, Dorothy Rabinowitz said: “Envision what happens when you get a government that is run by an autocratic mayor." Failure to pass a congestion tax in NYC has kept the congestion intolerable, with politicians electing to look out for their suburban driving constituents over the efficiency of the city. There is good news though: Americans may have hit peak driving. It appears that the nation’s annual miles driven are on the decline, while public transit usage is going up. Cities are growing at a faster rate than the national average, partly due to the fact that cities are able to integrate walkability (the ability to walk around the city and not rely solely on your car), which leads to healthier communities and people. We hated the car when they were getting 10 miles to the gallon. As cars became more efficient, we began to forgive them. We have slowly stopped hating the car, but maybe we shouldn’t. Reuben Jaffe Goldstein is a postgraduate student pursuing her MBA in Sustainable Management at Bard College.